A newly released beta version of iOS 4.3 reveals that the iPhone and iPad may be in store for some interesting new features. Hidden in the iOS 4.3 code are clues that suggest GSM iPhone support for Personal Hotspots — effectively wireless tethering — and a new multi-touch system geared specifically for the iPad’s large screen. The iOS 4.3 build also suggests that the iPad and iPhone are due for a hardware upgrade soon, too. As of now, it looks like iOS 4.3 will only support the iPad, the iPhone 4, iPhone 3GS, and the third- and fourth-generation iPod Touch. 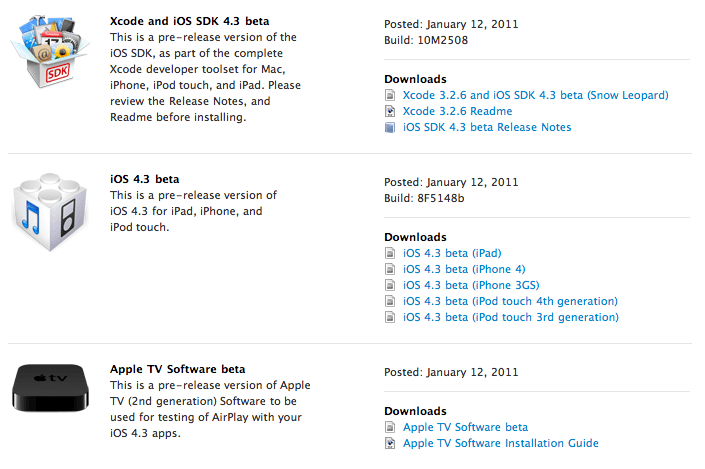 Apple released the beta version of iOS 4.3 to developers on Wednesday. The new beta confirms reports that the Personal Hotspot feature — outlined in Verizon’s iPhone announcement on Monday — is expected to be supported on GSM iPhones in the iOS 4.3 update (whether AT&T decides to allow its iPhone customers to use the service is a another matter). The Personal Hotspot will allow up to five devices to share an iPhone’s 3G data connection over Wi-Fi. According to MacStories, iOS 4.3 will include support for a new range of 4- and 5-finger motions to control the iPad. Users will be able access different iPad menus by swiping the screen in a particular direction. Developers have also noticed that included in the new build is support for third-party app access to Apple’s AirPlay feature. AirPlay allows iOS devices to connect to sound and video components through a Wi-Fi connection for wireless music and video streaming. MacRumors has reported that embedded in the iOS 4.3’s settings is mention of a feature called “Find My Friends,” which appears to be a location-sharing service à la Google’s Latitude app. The “Find My Friends” appears to be tied into Apple’s exisiting MobileMe service, which requires a $99 annual membership fee. Perhaps most interesting of all is the mention of new iPhone and iPad models in the iOS 4.3 build. Engadget reports that there’s evidence of two new iPhone models — referred to as 4.1 and 4.2 — and three new iPad models — referred to as 2.1, 2.2, and 2.3. To be clear, AT&T’s GSM iPhone 4 is listed as 3.1 and Verizon’s just-announced CDMA model as 3.2, so it looks like these are entirely new models. Let the iPhone 5 speculation begin.